Need to test electricity or solve automotive & household electrical problems with multimeter? Want more accurate range display as 2000 counts, leading top of current technology? 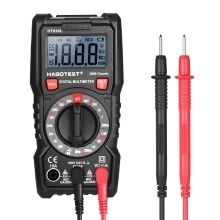 You can choose our HABOTESE multimeter. This brand new multi-functional multi meter with high precision and high performance MCU processor can measure DC/AC voltage, DC current, resistance. It can also test diode and continuity. With a bracket on the back, convenient to place it on the table and read the values. 2000 Counts & Multi-function: Max. display value 2000 counts and test AC/DC voltage, DC current, resistance, 1.5V/9V battery test, continuity, diode with lightweight and full-featured design. Precision Circuit Board & Overload Protection – With over load protection, quickly test voltage, shielding interference & continuity test can be 30Ω. Show "OL" on the LCD if overload. More Functions Selection: Test with reinforced insulation protection to ensure your life safety, with low battery indication, data hold, auto power off function and full symbol display clearly. Easy to Use & Clear to Read: Easy to operate, accurate readings, low power consumption, perfect home tool for the laboratory, home, factory, etc. Protected by rubber for drop protection. Portable Design: There is a back bracket for supporting multimeter, and also can collect test probe for your convenience. Backlight LCD for easy operation in dimly lit areas.